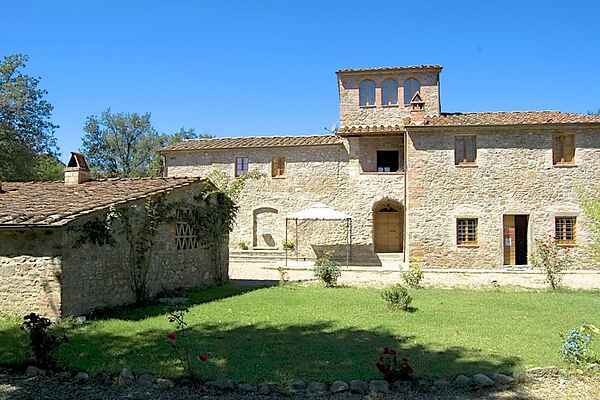 This lovely agriturismo is located in the beautiful rolling hills of the Aretini hills. The agritourism consists of three rustic houses with eight apartments. The apartments have a typical Tuscan style with terracotta stone floors, stone walls and ceilings with stone and wooden beams. The furnishings are rustic Tuscan. At about 3 km from the village of Ambra is with shops and a bar. There is also a horse riding school nearby and 7 km away is a tennis court. Around the farmhouse is a large garden and there is a lovely communal pool. Beside the pool is a sun terrace with a lawn and deck chairs. Nice place to relax and to enjoy a glass of red wine. Each apartment has its own private terrace. The big barbecue or pizza oven you can always use. Ask the owner how to make a pizza! He explains it with great pleasure. The agriturismo has all kinds of information and brochures on the environment and on request organized a wine and olive oil tasting. The agriturismo sells wine, honey, olive oil, vin santo and cherries in grappa. Experience true Tuscan life at this agriturismo. A nice day trip is the Therme of Rapolano, relax and bathe in natural hot water. Delicious.